You Don’t Like Uncle Chris? Generally, I get along well with children and animals. Something about my disposition, personality, or perhaps my general vibe, helps us “click.” This was not the case, though, when I recently met the three-month old daughter of friends here in Bangkok. This little pumpkin was fussy from the get-go, giving me only a few tear-free minutes. 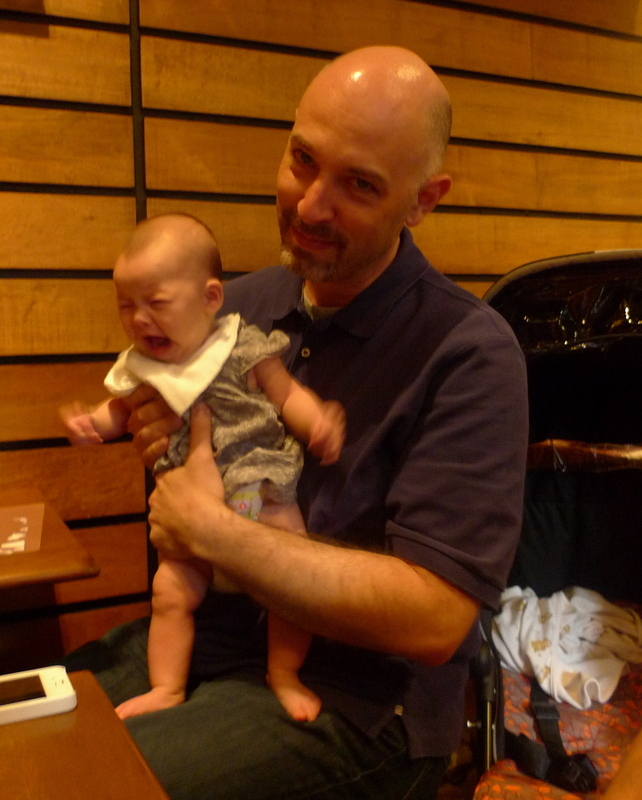 I tried rocking, standing, sitting, cooing, singing… anything to soothe her. Eventually, giving her back to mom was the answer. This entry was posted in Uncategorized and tagged Babies, friends by christao408. Bookmark the permalink. I hope you didn’t lose your magic touch! Maybe this little bugger was just possessed. hahahaha…. my cousin’s baby was like that. I carried her for about 1 minute before she realized I wasn’t daddy. That’s a wonderful expression on your face, Chris! Aww. Maybe she is colicky. You two look cute . Some things were never meant to be. Babies can be picky like that. Don’t take it personally. Awww, poor thing–and the baby, too. Some little kids don’t like my hubby and think it’s because of his beard. The expression on both your faces says it all. Yepper, back to mum. This made me laugh… sorry Chris, I guess you can’t win ’em all over. But I’m sure you haven’t lost your touch. HA! My daughter was just like that. She’s still kinda like that at 6. You have no idea how many kindly people, accustomed to being beloved by children and animals, have been hurt by my daughter. It’s so embarrassing. Babies hate me, sigh. Probably because I’m terrified of them. you two do look good in the pic, and yes I am very evil, I like seeing kids crying…..hahahahahha so don’t come near me…….